I need suggestions: Although I really like brick patios, I'm wondering if a deck would not make more sense. 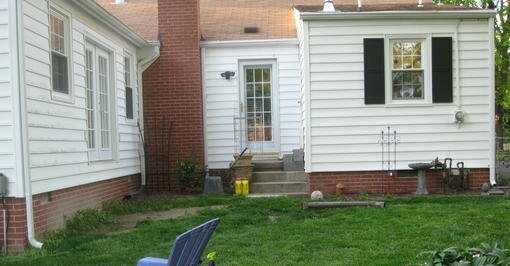 Easier to construct a deck level with the French Doors and the other doors on the rear of the house? or install a brick paver patio with steps leading down from the French doors. BTW, I have several utility cables buried parallel to the foundation, so I would need to consider future access. Thanks for checking out my post!! I would humbly suggest you talk to a deck designer / builder like our company. One with the years of experience to be able to know which types of decking work in your climate zone, what side of the home it is located, and it's use. I would suggest a free standing deck, you drop a minimum 1" below your door thresholds. I find a beam with cantilevered joist for cladding is best, it won't effect your home with penetrations and flashing details. Preferably a denser blind fastened composite like Fiberon, then the design would depend on your use. Can you use it year round, specific areas for seating, dining, bbq, children, shading, plants and so on. HELP - cover my hole...with a deck? Suggestions Needed for Pealing Ceilings!